I’m not going to bore you with names like Jonathan Lucroy or Giancarlos Stanton. I’m also not going to debate with you about Troy Tulowitzki because, quite frankly, there isn’t an argument as far as I’m concerned. Anyone who has paid attention to the 2014 Major League Baseball season knows where the National League’s Most Valuable Player resides; and it also happens to be where the best pitcher in baseball resides. It takes a really special performance from a pitcher for me to consider a pitcher for an award, I feel, should go to a position player because they play every day and tend to have more of an impact on the teams results. In fact the few I’ve witnessed during my lifetime such as Dennis Eckersley (1992) and Justin Verlander (2011) were clear examples of those types of performances. If June was any indication of what Clayton Kershaw is going to do in 2014 he is well on his way to joining them. When the Los Angeles Dodgers got off to an inauspicious start again in 2014, a lot of lip service was given to a lot of different reasons. The drama surrounding Puig, the outfield and their injury issues, and the manager not being capable were all reasons why this team had underperformed to the San Francisco Giants (whom I picked as the NL West champs in 2014). The Dodgers came into the season riding a huge wave of momentum from their 2013 NLCS trip, but when Clayton Kershaw was sidelined with a back issue many put it off as something the Dodgers could ‘get through’ since they had Greinke, Ryu, and a healthy Beckett. That didn’t prove to be the case when the Giants had an 9.5 game lead on June 8th. 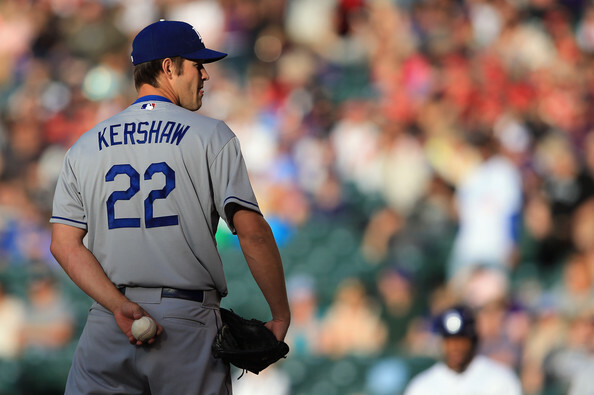 Clayton Kershaw got things going that very same day. Aside from Kershaw’s ridiculous numbers in June (6-0(in six starts), 61 K’s (4 BB’s), 4 earned runs, 0.82 ERA) it was when he really got dialed in that the Dodgers were able to wipe out that 9.5 game deficit to the Giants before the month of June ended. Even scarier is that he’s carried that over into July (2-0 (two starts), 0.53 ERA, 19 K’s (2 BB’s), 1 earned run) and doesn’t appear ready to let up. Performances like these, when a player puts the team on his back no matter the position, should be recognized for what they are: historic. Who says he can’t keep it up? If you caught his perfect-game (I call it HIS perfect game because Hanley Ramirez was the only imperfect part about it) you saw a Colorado Rockies team that looked lost against him. If you watched the shortened game in Denver when he pitched five of the six innings played and struck out nine you only wished the game would have kept going because you were bound to see something special that night. So again I tell you, I’m not going to argue or debate about Andrew McCutchen or Paul Goldschmidt. I won’t give any energy to any conversation about the National League MVP that doesn’t start and end with Clayton Kershaw because no one, no one, has been more integral to his team this year than Clayton Kershaw. If you don’t agree you know where to find me.